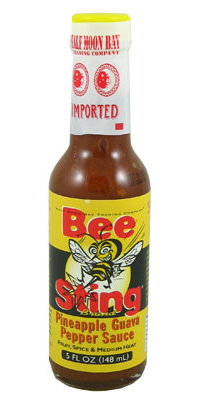 Bee Sting Pineapple Guava Pepper Sauce is a tropical blend of pineapple, spices, guava, red jalapenos and the secret ingredient, rainforest honey! This sweet treat can still burn, but it is outstanding when added to freshly grilled grouper tacos or when poured into a fresh batch of seafood gumbo! All the ingredients from the Bee Sting Pineapple Guava Pepper Sauce are fresh and delicious! Ingredients: Water, pineapple, guava, corn syrup, red jalapeno peppers, vinegar, sugar, honey, corn starch, salt, allspice, ascorbic acid (vitamin C), clove, citric acid, & 1/20 of 1% sodium benzoate as a preservative.